As is known at the end of 2015 ago, the city of Bandung was chosen to be one of 47 cities in 33 countries that are part of Creative Cities Network Unesco. Precisely December 11, 2015, and announced directly by the Director General of UNESCO Iriana Bokova at UNESCO headquarters in the French city of Paris. The city of Bandung is included as the world's creative city in the field of design, as well as being the 2nd city in Indonesia after Pekalongan in the field of Kriya and Folk Art. The goal of the creation of Creative City UNESCO itself is a bridge that combines the role of culture becomes an important part of development policy in the future. Bandung Creative Hub (BCH) stands on a building consisting of six floors of the building. Style or architectural design owned by Creative Center Building in Bandung City became one of the Unique Tourist Places in Bandung. One of the unique examples of this BCH Bandung building is the striking parts contained in some of its outer walls given ornaments. This is what distinguishes the model of other buildings in Bandung in general, which although the structural concept is still the same. But since this is a Creative Building, the building is given a touch of creativity by covering the outside of the wall with extrude or ornament. The extraordinary thing is the ornaments or extrudes installed in addition to functioning as decoration, also given a lamp in every fold, so if we look at it at night, ornaments or Extrude in Building Bandung Creative Hub will light up and emit light, wow cool is not it? 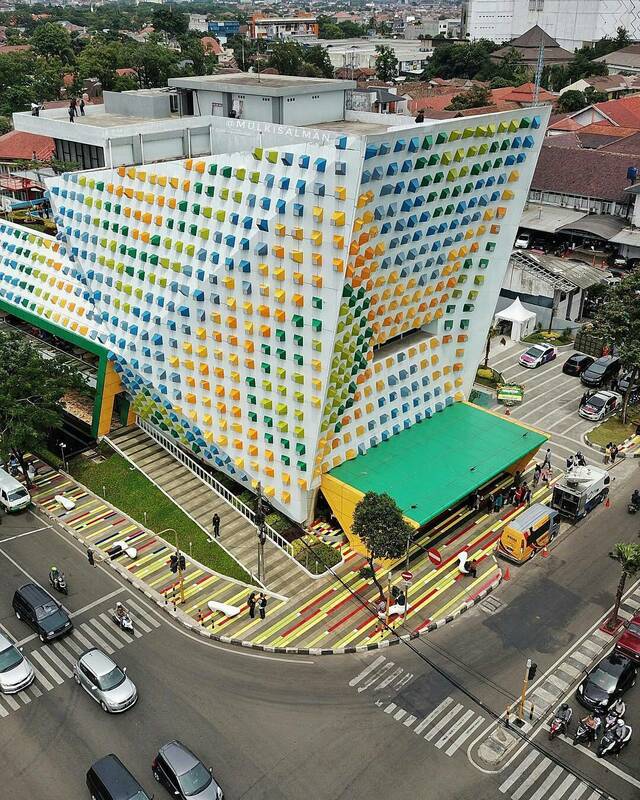 The building of the Bandung Creative Center building is listed as the first creative center in Indonesia, and became the second Creative Center in the Southeast Asian countries (ASEAN) region after the existing Thailand Creative & Design Center (TCDC). Bandung Creative Center consisting of 6 floors this in itself has as many as 20 rooms. To facilitate pengujunjung in accessing each of these floors, building of Bandung Creative Center building is already equipped with elevator and stairs. Each room in the building BCH Bandung has its own function - own, tailored to the allocation. For that, every wall of the room in this building any different floors. And even on some floors of the building, we can see the art of drawing on the wall that is currently trendy in bandung, namely Mural. The BCH room itself has a Community Room, Fashion, Gallery / Museum. No less interesting than BCH Bandung is also going to be one place to eat in Bandung. Here will be provided several places to eat and at the same time hang out a fun classmate Cafe and Restaurant. In fact, Resto & Cafe in Building BCH Bandung, entered into the list of Cafe in Bandung is open 24 hours, so it can be visited at any time. The operational time of Bandung Creative Hub (BCH) itself, certainly will be a tourist attraction in Bandung which is open 24 hours, but specially for certain tourism facilities such as cafe and restaurant, while other rooms start from 08.00 - 22.00 WIB. Jl. Laswi No.5, Kacapiring, Batununggal, Bandung City, West Java 40271.